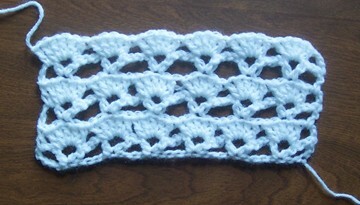 This crochet stitch uses a combination of the v-stitch and the large shell stitch. This pattern would be a great stitch to use in crocheting your favorite afghan. Row 1: In 8th chain from hook (1dc ch2 1dc, ch3), *[skip 4 chs, 1dc ch2 1dc, ch3], repeat from *to last 3 stitches, ch2, 1dc in last ch, ch3 and turn. Row 2: *[5dc in ch2 sp] (between dcs of v-stitch), repeat from * in each v-stitch across to last 3 chs and 1dc in top of last ch (3rd ch from hook), ch3 and turn. Row 3: Make v-stitch in center stitch of next shell, *[ch3, v-stitch in top of next shell], repeat from * to end of shells, ch2 and 1dc in top of turning chain.